A little while ago, I came to the conclusion that I’d watched House of Dark Shadows and Night of Dark Shadows too early in my viewing of the television series; I decided that I’d watch them again after I’d finished the show to see if I understood how they fit into the overall story better. With that purpose in mind, I Netflixed both this past weekend. I also took the opportunity to get some screencaps to dress my old reviews up. At the end of my original review of this film, I said that I could never tell Maggie Evans’s and Carolyn Stoddard’s respective fiances apart. The first thing that strikes me as I watch the movie again, is that I can easily identify Maggie’s and Carolyn’s fiances now, although I note that neither young woman was ever engaged to anyone similar in the course of the show. Maggie is engaged to Jeff Clark; he’s still played by Roger Davis, but apart from having the same name, the character doesn’t seem to be the Jeff Clark who was the reincarnation of Peter Bradford and who married Victoria Winters before they both disappeared into the 1790s. 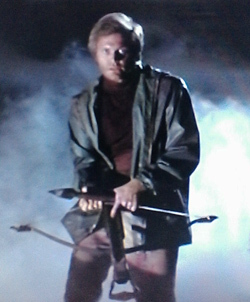 But I liked the show’s Jeff enough that I could root for the movie version this time around, especially when he became the Fearless Vampire Hunter and went running around with a crossbow near the end. Carolyn’s fiance is Todd Jennings, a character who doesn’t appear at all on the show, but he’s played by Don Briscoe, who was also the twin brothers Chris and Tom Jennings. This suggests to me that Chris the Werewolf and Tom the Vampire were actually triplets, along with Todd the Regular Guy. The Daphne Budd who gets killed right up at the beginning of the movie is not played by Kate Jackson and isn’t connected to Jackson’s character Daphne Harridge who appeared late in the series. She isn’t around long enough to develop much of a character anyway. I’d only seen the actor Thayer David playing the Collinwood handyman Matthew at the time I first watched this film, and the character of Professor T. Eliot Stokes was completely unfamiliar to me. But because I’d seen him in this film, I did recognize him immediately as Professor Stokes when he showed up on the show. Dennis Patrick as the Chief of Police, however, is more curious. The Collinses call him by his first name, George, and he seems to be an old family friend. I’d assumed that this same character would likewise feature on the show at some later point, but he never does. * Dennis Patrick shows up again eventually as Elizabeth Collins Stoddard’s long-missing husband. I also notice that other recurring actors on the show have tiny roles in this film: Humbert Allen Astredo, who played the satanic Nicholas Blair, is the doctor who attends Maggie after Barnabas attacks her. Terry Crawford, who was the maidservant Beth in 1897 and Edith Collins in 1840, is a nurse at the hospital. 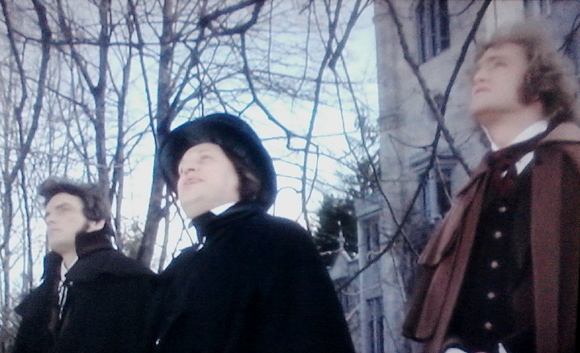 Jerry Lacy, who played the various Trasks throughout Collinwood’s history, is the priest at Carolyn’s funeral. Even though this film was made in 1970, near the end of the series, and the character of Barnabas Collins had undergone some serious alteration since his initial appearance in 1967, the film version of Barnabas remains the predatory monster we were first introduced to. Apart from his courtship of Maggie during the weeks in which he’s being cured of his vampirism, he’s a cruel and cold-blooded killer. In addition to the murder of Daphne, he’s responsible for the deaths of Dr. Hoffman, Roger Collins, Professor Stokes, and Carolyn indirectly after he turns her into a vampire for no good reason and she ends up with a stake through her heart. He also beats Willie savagely with his cane for trying to warn Maggie about the danger she’s in, and victimizes Maggie once he reverts to his vampire ways. This made seeing him get a great big arrow through the chest satisfying, even though the film cheats at the very end by implying that Barnabas had survived and would be back. I was left wondering how they could be planning a sequel when so many of the main characters from the series were dead. As it turned out, the next Dark Shadows film had nothing to do with this one. My impression of this film when I first saw it was that it featured Dark Shadows actors in a story that had little to do with Dark Shadows apart from a reuse of certain character and place names. Watching again now that I’ve gone to the end of the series, my impression remains the same–only I see now that there are even more Dark Shadows actors present than I was previously aware of, and that the story has nothing to do with any Dark Shadows I’ve seen. I’ve read a review or two that suggests that this film is indeed a sequel to House of Dark Shadows, and that this Quentin Collins (who isn’t over 100 years old and isn’t a werewolf) has inherited Collinwood from Elizabeth after the rest of the family was killed off in that first movie. But there’s absolutely no reference to the events of House of Dark Shadows here and I find the connection a tenuous one. As I proceeded with the series, I had assumed that at some point I’d eventually encounter a version of the characters shown in this film: limping, bad-tempered artist Charles Collins married to an incarnation of Laura Murdoch and having an affair with witchy Angelique, who was killing time during the early 1800s while waiting for her opportunity to torture Barnabas again. And what about the little girl living in the house in that same period? Toward the very end of the show, I looked for these characters in the 1840 and alt-1840 storylines, but there never was a little girl corresponding to the ghost-child in this movie, nor any Collins by the name of Charles played by David Selby or anyone else. There is a Gabriel Collins, Charles’s brother and played by Christopher Pennock just as the 1840s and alt-1840s Quentin Collins’s brother Gabriel was. That’s as near as we get to a character from the final episodes of the show. I also wondered about the modern-day Mrs. Danverseque Collinwood housekeeper Carlotta Drake, played by Grayson Hall. The closest we ever came to this character was Miss Hoffman in the alt-universe’s adaptation of Rebecca. She too was devoted to her own Angelique. No Alex and Claire Jenkins ever showed up either. This time around, I was more accustomed to see John Karlen and Nancy Barrett playing couples in different roles; they were William H. Loomis and the alt-Carolyn in the 1970s alternate dimension, Carl Collins and Pansy Faye in the 1897 storyline, Desmond Collins and Leticia Faye in the 1840s, and Kendrick and Melanie in the alt-1840s. The two were paired off so often that I began to wonder if the actors were actually an item at the time, but John Karlen in one of his DVD interviews said not. There is no storyline related to the one in this film. This time around I recognize Thayer David as the witchfinder reverend who accuses Angelique of witchcraft and hangs her from a tree in the Collinwood front yard; I assume they couldn’t get Jerry Lacy to play a Trask. Clarice Blackburn also appears very briefly as the 1800s Collinwood housekeeper, and James Storm, who played Gerard Stiles, is the creepy handyman who aids Carlotta in her plans to get rid of Tracy Collins so Angelique can have Quentin/Charles. Oddly, his character’s name is stil l Gerard Stiles. One last interesting bit of music recycling: during the film, whenever Quentin is remembering events from Charles’s life, a simple piano version of Quentin’s Theme –that sweet old waltz that 1897 Quentin played endlessly on his hand-cranked gramophone–is heard on the soundtrack. Later on, when Charles takes over, we hear the full, old gramophone version. * When I watched the early episodes of Dark Shadows again, I realized that this character was meant to be George Patterson, the same Collinsport Chief of Police first played by Dana Elcar and by other actors later on in the series.